It’s that time of year again, when the rain pours down and autumn leaves turn to pink at the Hard Rock Hotel. “Pinktober” is back again at the Pattaya beachfront hotel and cafe, with events and fundraising going on all month to benefit the Thanyarak Breast Cancer Foundation, Breast Caner Research Foundation, and Caron Keating Foundation. The annual pink parade will not kick off the event this year, with instead a concert by ‘Splitfire’, the Hard Rock resident band starting the festivities from 8:00-8:30 p.m., followed by the Pinktober Fashion Show from 8:30-8:50 p.m. Activities will continue until about 1 a.m., including more music from musicians Sukunya Migel, Ice Weeranukul and the Hard Rock Pattaya Band. 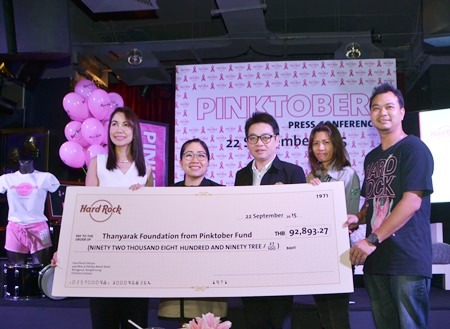 (From left) Anusara Kithisook, PR manager of the Thanyarak Breast Cancer Foundation, Yuwathida Jeerapat, Pattaya City Councilor Region 2, and Rattanachai Sutidechanai, vice chairman of the Pattaya City Council, along with Hard Rock staff, display a cheque for over 92,000 baht raised by selling pink products, food, beverages and accommodations since October last year, which has been donated to the Thanyarak Breast Cancer Foundation. Special offers, such as the “Pretty in Pink” promotion, will run through the entire month of October, offering Pink Chicken Burgers, Pink Drink Rita, Pink Wildberry smoothies and more. Eighty percent of all pink products will be going to breast cancer research. For more information, visit Pattaya.HardRockHotels.net or call 038-426-635.